The UK’s best-selling waterproof wall panel manufacturer has launched a large-format outdoor advertising campaign featuring the Made in Britain marque. Multipanel’s ‘Smart Alternative to Tiles’ campaign also features the familiar face of the nation’s best-loved interior designer, Linda Barker. This, the company believes, will help viewers make an immediate connection with their product. Proudly displaying the registered Made in Britain logo, guarantees the provenance of the products. Designed to stand out in the darker autumn days and nights and to capture the interest of drivers and pedestrians, the campaign comprises a mix of digital, backlit and traditional illuminated billboards sited along major arterial routes including Birmingham’s Haden Circus and Newcastle’s Byker Bridge. Other locations include Glasgow, Leeds, Birmingham, Slough, Luton, Bristol and Bradford. 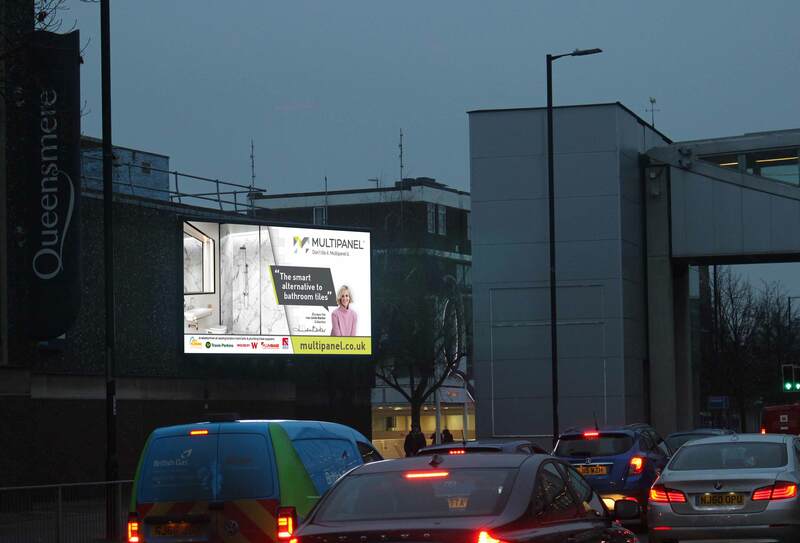 Multipanel, a brand of Grant Westfield Ltd, has the largest share of the waterproof panel market in the UK, manufacturing over 8,000 panels each week, so this marketing campaign is all about building even greater brand awareness and growing sales through merchant partners. Integral to the company’s long-term marketing strategy, the campaign follows Multipanel’s highly successful new product launches, including the Linda Barker Collection, earlier this year. Sarah McLean, managing director, Grant Westfield, said, “Outdoor, roadside advertising is a first for the company, and we are confident that it will cut through a very noisy media landscape, and provide us with a fantastic opportunity to grow awareness of and to make the Multipanel brand resonate with consumers.